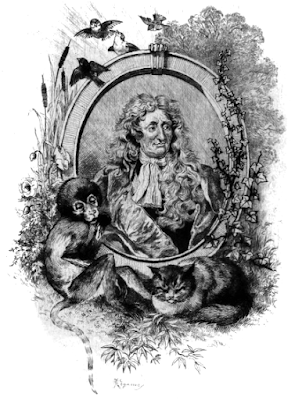 Portrait of Jean de La Fontaine. "Jean de La Fontaine was born on the 8th of July, 1621, at Chateau-Thierry, and his family held a respectable position there. His education was neglected, but he had received that genius which makes amends for all. While still young the tedium of society led him into retirement, from which a taste for independence afterwards withdrew him. He had reached the age of twenty-two, when a few sounds from the lyre of Malherbe, heard by accident, awoke in him the muse which slept. He soon became acquainted with the best models: Phoedrus, Virgil, Horace and Terence amongst the Latins; Plutarch, Homer and Plato, amongst the Greeks; Rabelais, Marot and d'Urfe, amongst the French; Tasso, Ariosto and Boccaccio, amongst the Italians. He married, in compliance with the wishes of his family, a beautiful, witty and chaste woman, who drove him to despair. He was sought after and cherished by all distinguished men of letters. But it was two Ladies who kept him from experiencing the pangs of poverty. La Fontaine, if there remain anything of thee, and if it be permitted to thee for a moment to soar above all time; see the names of La Sabliere and of Hervard pass with thine to the ages to come! Amongst a large number of works that he has left, everyone knows his fables and his tales, and the circumstances of his life are written in a hundred places. He died on the 16th of March, 1695 and was buried in the cemetery of Saint-Joseph, by the side of Moliere."